Photo at top shows vegetation burning in Kingsville Dome uranium mine wellfield. Photo at bottom shows fire after ignition of plastic pipe. Photos taken approximately 1:00 PM August 10, 2011 by Dr. Mark Walsh at PAA1, Kingsville Dome (Uranium Resources, Inc.), six miles southeast of Kingsville, Kleberg County, Texas. A brush fire fueled by 40 mile per hour winds raced through a wellfield of the Kingsville Dome in-situ leach uranium mine starting Tuesday night and continued intermittently through Wednesday afternoon. The Kleberg County mine is located roughly 30 miles southwest of Corpus Christi in south Texas. The fire in Production Authorization Area #1 ignited polyvinyl chloride (PVC) and high-density polyethylene (HDPE) pipe previously used to transport uranium-rich production fluids from the underground sandstone formation to a uranium processing facility. Combustion of PVC produces highly toxic dioxins. According to the 2009 annual report by Uranium Resources, Inc. (URI), the company that owns Kingsville Dome, uranium production was stopped in July 2009, Since then, the company has been conducting aquifer restoration activities which involves pumping out groundwater contaminated with uranium, radium, and other heavy metals for treatment or disposal in evaporation ponds or deep disposal wells. It is unknown if pumping was underway when the fire broke out. Acting quickly to downplay the incident, URI sent Executive Vice President Richard A. Van Horn to engage reporters from the Corpus Christi Caller Times. In the process, Van Horn seemingly made several questionable assertions in his attempt to minimize the potential effects of the fire. Van Horn told reporters that the mine has not been in use since 2008 and that it is no longer an active mine because it is currently in the reclamation process. The time since cessation of uranium production is relevant because it affects the concentrations of uranium and heavy metals in the groundwater being pumped out of the aquifer during restoration. Van Horn's assertion appears to conflict with URI's 2009 annual report. Characterizing Kingsville Dome as inactive is also misleading. Aquifer restoration activities can extend for several years after uranium leaching is stopped. During this time, millions of gallons of contaminated groundwater are pumped to the surface for treatment or disposal. In a second news story that came out on Wednesday morning, Van Horn is quoted as saying "There's no danger of radiation," and "The only thing that burned, other than grass, was some plastic pipe." Van Horn told reporters the PVC pipe was most recently filled with water and that the company tested soil samples after the fire and found nothing of concern. Van Horn failed to mention that the water carried by the PVC pipes likely contained elevated levels of uranium, radium, and other heavy metals. And it is unclear how he could make any definitive statement about radiation danger as the incident was still unfolding. The fire flared up a few hours after the Wednesday morning story was posted on the Caller Times' website. 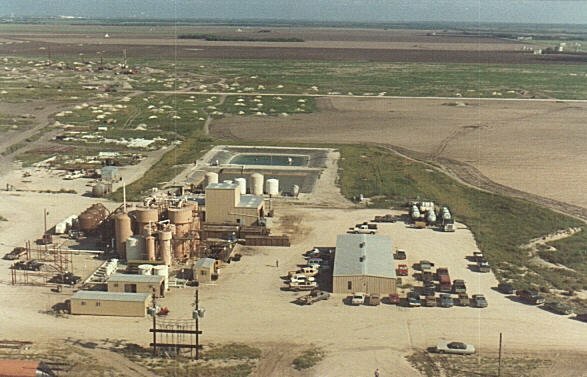 A third news story reported that the Texas Commission of Environmental Quality (TCEQ) took air quality readings at the site and found no evidence of radiation or other harmful contaminants. No details are given concerning the locations where readings were taken, how sampling and testing was conducted, and which contaminants the TCEQ tested for.